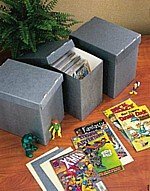 Comic Book Supplies; Required Items for Collectors! Comic book supplies! Any serious collector is going to need various supplies and paraphernalia to preserve, maintain and organize their collections. I have had the dubious pleasure of coming into contact with an individual who is very knowledgeable in this area. James Tyler has had much input to this particular page of my site. I first met Jay, as he likes to be called, through the Internet when he was serving a tour of duty in Iraq, and I highly commend him for his services to our country. He has though, maintained an interest in comic books and found me through this site. One of his projects when he got back to the states was to develop his own comic book supplies business. The last I heard he was working in a comic book supplies store in California. De-acidification paper-These sheets when interlaced into the comic book, will collect harmful pollutants and help to neutralize the acidification process, which will tend to discolor and destroy the paper. Protective Bag-Wrapping the comic book in a protective cover (Mylar bags work the best), will help wage the war against moisture, air pollutants and human skin oils. Rigid Backboard-Using a contamination free rigid backing behind your comic book in the protective bag will eliminate bending, folding and cracking. Storage Box-Any collection should be kept in a good contamination free box. This will help keep your collection organized and protected from physical damage. At this point I would like to present a discussion, and more sources where you can read to your heart’s content, that may or may not be of serious interest to you. If you are into chemistry, the technical resources may be more your cup of tea than they were mine. It has been years since I have studied chemistry seriously. I will also inter-mingle information that Jay has so generously supplied to me. De-acidification products are usually used to neutralize acids in the paper prior to storage of most paper products of a pulp nature. This is not to be taken lightly. It is considered by most, an extensive form of restoration. Current understanding of the process is that the staples are removed from the comic book and the sheets are submerged, film developer style, in a bath of a de-acidification product. Then the entire book is rebuilt with new staples. The whole process can cost about $50 when done by a professional. Now this is rather spendy for one comic book, but this process can double the life of your magazine. I guess it really depends on what you consider each one of your comic’s worth is and how much deterioration has taken place. Now Jay has alerted my to a site that really goes into great detail discussing comic book supplies chemistry. If you really want to get to the nitty gritty, go grab your favorite beverage, sit back and prepare to absorb this information. You may want to bookmark this site. And one more site worth book marking is Eclipse.com.Both of these sites are for the highly serious comic book collector and they discuss comic book supplies using a material called MicroChamber, which appears to be on the order of 10 fold better for comic book preservation than most other more common supplies. It's not exactly a huge industry secret, but CGC uses these materials in every comic they grade. Be forewarned though, supplies using this material AIN’T cheap. But if your collection is highly valuable, you may want to consider these comic book supplies from the above sources. Otherwise the considerably less expensive comic book supplies you can obtain downtown at a reputable comic book store, will more than suffice your needs. Here is a great tip from Jay - To fight water problems I have found a relatively simple solution for those that live in humid areas. A desiccant is a chemical sieve for water, and is available for industry use in small packets or in buckets. For our purposes an 8 oz can (that looks like you'd keep a grasshopper in) can be simply put inside the box to absorb moisture and indicates when it is full by changing from crystal colored to pink. These same cans can then be reused by baking them for 3-4 hours in an oven at about 350 F. These will run you about $9-$10 from GAYLORDMART. 1 canister per short box, and 2 per long box should do the trick. I am still looking to see if the little packets like you find with shoes are safe to put in the bags. They are even more inexpensive. Well, all this technical info, if you have visited the links above, should keep your mind reeling for a while. Maybe if we ask him real nice, my resident expert, Jay will supply me with tidbits of information and tips from time to time. I will then be able to post them here at my site and/or send them out in my newsletter. And we will watch as Jay’s comic book supplies business continues to formulate and build. If you want to keep up on other supply resources, then feel free to sign up for my newsletter “Comics Galore” in the form below.